The song became a popular jazz standard, appearing on over 1300 albums performed by over 600 artists. In 2015 it was announced that the Gerry Mulligan quartet featuring Chet Baker's version of the song was inducted into the Library of Congress's National Recording Registry for the song's "cultural, artistic and/or historical significance to American society and the nation’s audio legacy"
Former long-time Swingle Singer Jonathan Rathbone arranged many of the ensemble's arrangements and here is a wonderful collection of some of his best and fun to sing arrangements. These songs are so wonderful they have become part of the great American songbook. The timeless ballad "Unchained Melody" is simply breathtaking! Perfect for concert groups or pop ensembles, this is an arrangement will become a staple in your repertoire. "My Funny Valentine" is on just about everyone's top ten list of all-time classic ballads! Lush harmonies, varied textures, and a timeless melody and lyric...this is it! "Always" has been recorded by hundreds of major artists over the years, the classic simplicity of this Irving Berlin song makes it one of our most treasured standards. This expressive a cappella setting for women's voices will create a magical moment in performance! The classic Irving Berlin song "What'll I Do" was sung by Judy Garland and is a popular standard that has been performed by many great singers. This stellar a cappella arrangement is a real treat and is a perfect song for female voices. Songlist: Always, Unchained Melody, My Funny Valentine, What'll I Do? "When I'm 64" - This Lennon/McCartney favorite is as charming as ever! Bass primarily has a walking line, while the melody changes hands from the soprano to the tenor. "Don't Know Why" - A ballad of the 40's in block harmonies. The tempo is medium. "My Funny Valentine" - Classic ballad by Rodgers and Hart. This jazz arrangement features lush harmonies and many solo lines for all parts. This collection delivers plenty of musical flair at a value! Perform these popular pop and jazz classics arranged for a cappella voices and use as a curriculum with your vocal jazz group. And there's more! Purchase the 12-Pak and receive a code to access demo and learning tracks online through My Library. "It Only Takes a Moment" - The beautiful song from Hello Dolly in a lush a cappella ballad setting! With heartfelt lyrics, rubato phrases, and rich choral harmonies, this will be a wonderful feature for jazz, pop and concert choirs. 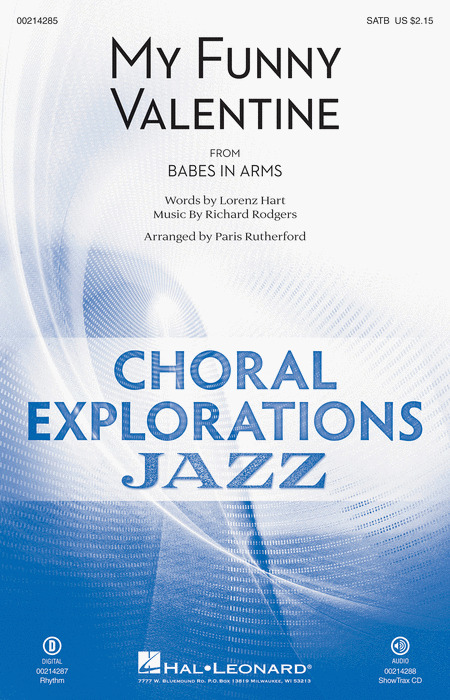 "My Funny Valentine" - A lush a cappella setting of this timeless standard features soprano solo or soli. Quite accessible! "Their Hearts Were Full of Spring" - Originally popularized by the Four Freshmen, this iconic arrangement of the Bobby Troup song helped pave the way for a cappella vocal jazz as well as influencing the singing style of the Beach Boys. "The Nearness of You" - One of the greatest songs of all time, Hoagy Carmichael's classic romantic ballad shimmers in a rich a cappella setting highlighted by lush harmonies and gently arched phrasing in this superb arrangement. The classic Vincent Youman song "Without a Song" has delighted audiences for decades and has been recorded by artists of every genre. Kirby Shaw has added his superior arranging talent to provide us with a truly wonderful new arrangement. You don't even have to hear this arrangement of "My Funny Valentine" to know how good it is, because it already has the top two ingredients: 1) a great tune, and 2) one of the best arrangers around. Kirby has taken one of the most gorgeous ballads of our time and crafted a special arrangement that's bound to please. "Skylark" - A superbly crafted a cappella rendition of the all-time Hoagy Carmichael favorite standard, carefully woven to ensure logical voice leading for each vocal part. The arrangement smoothly flows from one lush harmony to another, each locked into the surrounding sounds, creating a tightly knit fabric of pure vocal pleasure. Stunning! Kirby Shaw's tradition for creating exceptional a cappella ballads continues with this wonderful arrangement of the Gershwin classic "Embraceable You." Showcase your singers with this very special arrangement! "How About You". This a cappella tour-de-force is designed to feature a quartet or the entire choir. This vocal adaptation of the Rosemary Clooney/Hi-Lo's recording will challenge the most adept vocalists and will likewise impress the haughtiest self-proclaimed vocal jazz aficionado. 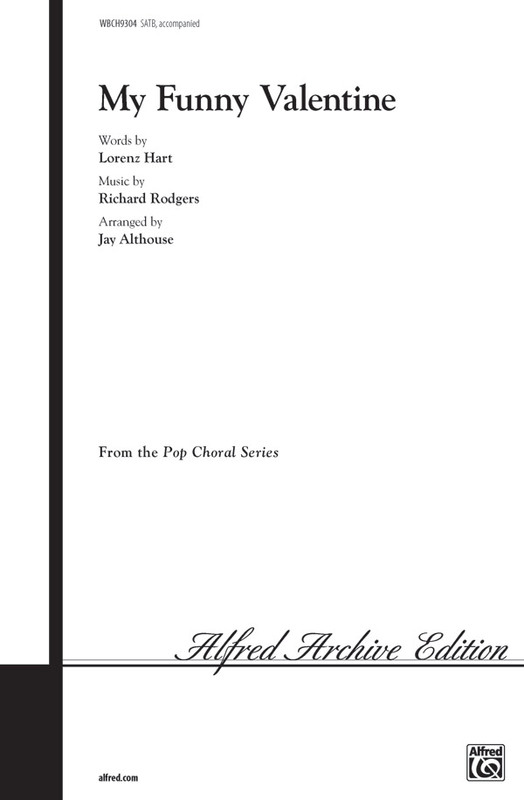 "For All We Know" is a lush four-voice a cappella ballad for soprano soloist. Written for and performed by UNC's SUS 4. The inclusion of the verse at the end is inspired by Mark Murphy's rendition. "Cielito Lindo" is a traditional tune with very unusual rhythm approach. Tempo: breakneck. Requires good, strong sopranos. This intense rubato arrangement of the Rogers & Hart classic " My Funny Valentine", though accessible to an upper-level high school SSAA group with some jazz experience, is challenging and muscially rewarding enough for the collegiate ensemble as well. Ranges are moderate: Soprano I extends up to F5, Alto II down to Bb3, keeping the harmonies close. A soprano solo is featured in the bridge over a three-part background, leading to a dramatic high point at "Stay, little Valentine, stay!" Suggestions for breaths, expressive markings and dynamics are detailed in the score. "Unchained Melody" - This timeless ballad is simply breathtaking! Perfect for concert groups or pop ensembles, this is an arrangement will become a staple in your repertoire. "I Wish You Love" features two special soloists in this stunning a cappella arrangement that will work equally well for a large concert choir of smaller jazz or pop ensemble. Smooth legato lines and rich harmonies will create a breathtaking moment in performance! "Skylark" - Display beauty of tone and the deep emotion inherent in the lyrics of this contemporary a cappella setting of the Hoagy Carmichael/Johhny Mercer standard. Challenging, but impressive! "Last Night When We Were Young" - The splendor of falling in love is perfectly rendered in this stunning ballad that will create a moment of sheer breathtaking beauty in concert. This challenging setting explores the full palette of harmony and offers interesting contrasts in dynamics and texture. Belwin Jazz offers ten great jazz standards arranged for solo vocalist with a nine or ten piece combo accompaniment. These songs are superbly arranged by one of the finest writers in the business, Dave Wolpe. This collection is ideal for a vocalist who needs a smaller ensemble with four or five horns and rhythm section. The combo horns are trumpet, alto sax, tenor sax, trombone and baritone sax. The baritone sax part adds additional color to the texture but is optional. The rhythm section is scored for guitar, bass, drumset and a piano/conductor part which includes cues for the horns. This comprehensive collection is a matching folio to his double album of greatest hits. 21 songs from the collection featuring Ol' Blue Eyes' most romantic ballads. Includes: All the Way - Cheek to Cheek - I'll Be Seeing You - I've Got You Under My Skin - In the Wee Small Hours of the Morning - My Funny Valentine - Time After Time - Where or When - and more. Whether you're a karaoke singer or preparing for an audition, the Pro Vocal Series is for you. The book contains the lyrics, melody, and chord symbols for ten standards. The CD contains demos for listening, and separate backing tracks so you can sing along. The CD is playable on any CD Player, and it is also enhanced for PC and MAC computer users so you can adjust the recording to any pitch without changing the tempo. The 2 CDs that come with this Music Minus One vocals pack feature complete versions with example vocals, plus separate background tracks. Songs featured in this pack inspired by singer/actress Kristin Chenoweth include: Going to the Dance with You - How Long Has This Been Going On? - If You Hadn't But You Did - My Funny Valentine - Nobody Else But Me - Taylor the Latte Boy - You'll Never Know - and more. Whether you're a karoake singer or preparing for an audition, the Pro Vocal series is for you. The book contains the lyrics, melody, and chord symbols for eight hit songs. The CD contains demos for listening, and separate backing tracks so you can sing along. The CD is playable on any CD, but it is also enhanced for PC and Mac computer users so you can adjust the recording to any pitch without changing the tempo! This volume includes 8 jazz classics. Eight hits from Rodgers & Hart are presented in this package which is designed to provide the at-home singer with an actual professional setting. The CD features orchestral interludes and instrumental solos typical of a live club performance, retaining the natural performance flow of an actual performance with an accompanying rhythm section or orchestra. Includes the songs: I Didn't Know What Time It Was ¥ My Funny Valentine ¥ Nobody's Heart Belongs to Me ¥ A Ship Without a Sail ¥ Dancing on the Ceiling ¥ It Never Entered My Mind ¥ There's a Small Hotel ¥ Where or When. A massive collection of 73 songs, including a foreword by Dorothy Rodgers and indexes by show title and song title. Songs include: Bewitched - Blue Moon - Ev'rybody Loves You - Falling in Love With Love - Have You Met Miss Jones? - I Could Write a Book - I Didn't Know What Time It Was - Isn't It Romantic? - The Lady Is a Tramp - Manhattan - The Most Beautiful Girl in the World - My Funny Valentine - My Romance - Sentimental Me - There's a Small Hotel - Thou Swell - You Took Advantage of Me - and more. Selections range from their most popular productions to some never-before published material - a real collector's item! 288 pages. We proudly present a revised edition of this classic, featuring all-new digital engravings and the original Broadway artwork on the cover. 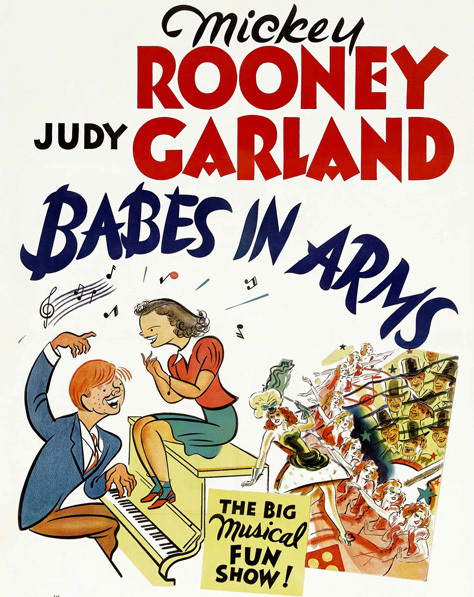 We've added three new songs (All at Once - Imagine - You're Nearer) to these huge Rodgers & Hart hits from this musical: Babes in Arms - I Wish I Were in Love Again - Johnny One Note - The Lady Is a Tramp - My Funny Valentine - Where or When. The All Music Guide calls Vaughan "one of the most wondrous voices of the 20th century." This collection gathers 25 of her classics arranged in her original keys so today's singers can try and match her performances. 15 essential standards have been given new arrangements tailor-made for singers, with alternative jazz chord changes, complete verses, introductions and singer-flattering endings. This book is in a traditional jazz format designed for improvising accompaniments, with melody line, lyrics and chords in a handwritten music engraving style. Traditional chord changes are also included, along with the alternative chords in Steve Rawlins' creative arrangements. Keys in the Men's Edition are in a generally higher range, as is customary for this style of music. The Men's Edition keys are in a medium range. The CD features a professional jazz trio of piano, bass and drums. A collection of 30 ballads recorded by Ella Fitzgerald, Billie Holiday, Diana Krall, Nina Simone, Sarah Vaughan, and more! Includes: Black Coffee; God Bless' the Child; I've Got the World on a String; It Might as Well Be Spring; The Man I Love; My Funny Valentine; and more. A collection of great songs from the 1920s-1960s, transposed into appropriate keys, based on original sources. This soprano edition includes: All the Things You Are - Blue Skies - Ev'ry Time We Say Goodbye - Fly Me to the Moon (In Other Words) - How Deep Is the Ocean (How High Is the Sky) - In the Still of the Night - Love Is Here to Stay - Moon River - The Nearness of You - Over the Rainbow - Someone to Watch over Me - When I Fall in Love - and more. A collection of great songs from the 1920s-1960s, transposed into appropriate keys, based on original sources. This mezzo-soprano/alto edition includes: All the Things You Are - Blue Skies - Ev'ry Time We Say Goodbye - Fly Me to the Moon (In Other Words) - How Deep Is the Ocean (How High Is the Sky)- In the Still of the Night - Love Is Here to Stay - Moon River - The Nearness of You - Over the Rainbow - Someone to Watch over Me - When I Fall in Love - and more. A collection of great songs from the 1920s-1960s, transposed into appropriate keys, based on original sources. This tenor edition includes: All the Things You Are - Blue Skies - Ev'ry Time We Say Goodbye - Fly Me to the Moon (In Other Words) - How Deep Is the Ocean (How High Is the Sky)- In the Still of the Night - Love Is Here to Stay - Moon River - The Nearness of You - Over the Rainbow - Someone to Watch over Me - When I Fall in Love - and more. A collection of great songs from the 1920s-1960s, transposed into appropriate keys, based on original sources. This baritone edition includes: All the Things You Are - Blue Skies - Ev'ry Time We Say Goodbye - Fly Me to the Moon (In Other Words) - How Deep Is the Ocean (How High Is the Sky)- In the Still of the Night - Love Is Here to Stay - Moon River - The Nearness of You - Over the Rainbow - Someone to Watch over Me - When I Fall in Love - and more. This whopping songbook features piano/vocal/guitar arrangements of 90 songs of devotion, including: The Anniversary Waltz - Canon in D - Can't Smile Without You - Could I Have This Dance - Endless Love - For All We Know - Forever and Ever, Amen - The Hawaiian Wedding Song - Here, There and Everywhere - I Only Have Eyes for You - I'll Have to Say I Love You in a Song - Just the Way You Are - Longer - The Lord's Prayer - Love Me Tender - May You Always - Misty - One Hand, One Heart - Somewhere - Sunrise, Sunset - Through the Years - Trumpet Voluntary - You Needed Me - Your Song - and many, many more! 50 Essential Jazz Standards from the repertoir of the greatest artists in New, Custom, Vocal Arrangements and singer-Friendly Keys with Traditional and Alternate Chord Changes. Cabaret is a form of entertainment featuring comedy, song, dance, and theatre, distinguished mainly by the performance venue - a restaurant or nightclub with a stage for performances and the audience sitting at tables (often dining or drinking) watching the performance being introduced by a master of ceremonies, or MC. Here are 54 essential cabaret classics. 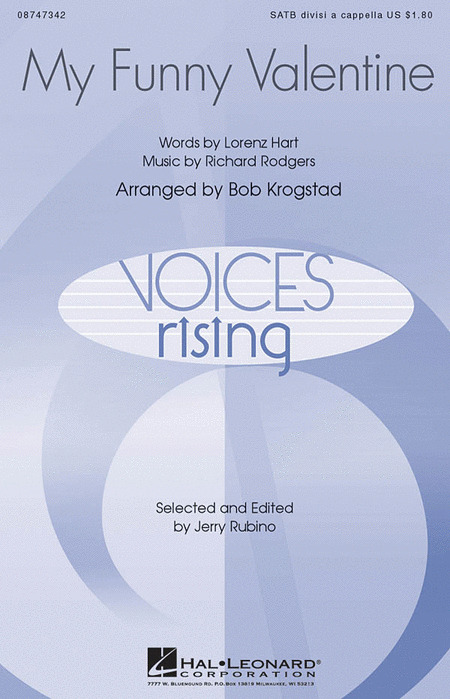 A great collection for women singers. All songs have been chosen especially for this type of voice, with careful attention to range and keys. Songlist: Anything Goes, At Last, Bewitched, Bothered and Bewildered, Cry Me a River, Don't Rain on My Parade, Dream a Little Dream of Me, Embraceable You, I Get A Kick Out of You, Misty, My Funny Valentine, Over the Rainbow, Someone to Watch Over Me, Summertime, They Can't Take That Away From Me, Whatever Lola Wants (Lola Gets), When I Fall in Love. The Rodgers & Hart standard has been recorded by many wonderful artists. Vocal jazz ensembles will amaze their audiences with this stunning bossa nova setting, as well as giving singers an opportunity to develop style and blend and enjoy singing these incredible lyrics. This great song is on just about everyone's top ten list of all-time classic ballads! Lush harmonies, varied textures, and a timeless melody and lyric...this is it! The subtle beauty of this timeless Rodgers and Hart classic is enhanced by Bob Krogstad's masterful arranging touch. The rich harmonies progress in a classic jazz style into a perfect unfolding at just the right melodic moment. Magical! Duration ca. 3:50. A lush a cappella setting of this timeless standard features soprano solo or soli. Quite accessible! Available: SATB a cappella. Performance Time: Approx. 2:30. One of the most well-known of the hit songs from the songwriting duo of Richard Rodgers and Lorenz Hart was featured on Broadway as well in several feature films. Teena Chinn brings us an easy-to-sing "a cappela" setting. This stunning rendition of a timeless classic is destined to become a standard in the choral repertoire. Exquisite harmonies and a beautiful accompaniment add that touch of class. Perfect for any performance setting, this one is a must!